Our Egyptian Muslim friends celebrated yesterday the birthday of Prophet Muhammad [Muḥammad], a celebration which came into being during the Fatimid period (909-1171 CE). Christians are preparing for the celebration of Christmas. Both celebrations are events that help us to think of those in need. On Friday November 16th, Brigitte Maras presented the case of her son Leslie in St. John the Baptist Church. It was deeply emotional. It is not easy for Leslie’s parents to leave their son in an Egyptian prison with a sentence for life. Prior to prison Leslie, his mother said, was a lively young man, always optimistic and willing to help others. In prison he has become a pastor and is one of the leaders of the church in prison which means organizing church services and counseling other prisoners. Leslie knows he was wrong in bringing drugs into Egypt, but has been able to keep his positive outlook on life. Leslie is hopeful that one day sooner or later he will be able to return to Belgium. Leslie and his parents are very positive about the Belgium Ambassador who, last year, was the first ambassador from their country ever to visit him in prison. Mother Maras calls for visits to her son in prison. Each visit is an encouragement that helps Leslie and his parents to carry on this heavy burden. See for more information our previous newsletter here. Intern Youssef R. Kamel [Yūsuf R. Kāmil] researched prisoner transfer treaties between Egypt and other countries. See for his report here. However, no such treaty exists yet between Egypt and Belgium. Egyptian authorities are indicating they could possibly be open to this solution, but this needs talks between the Belgium Embassy and relevant Egyptian authorities. Pastor Kingsly prayed for the family and asked God to open a road for a prisoner exchange, so that Leslie could complete his sentence in Belgium. After the presentation of mother Maras, Pastor Michael prayed for the family and called the congregation to support the family with prayer, visits and financial support. 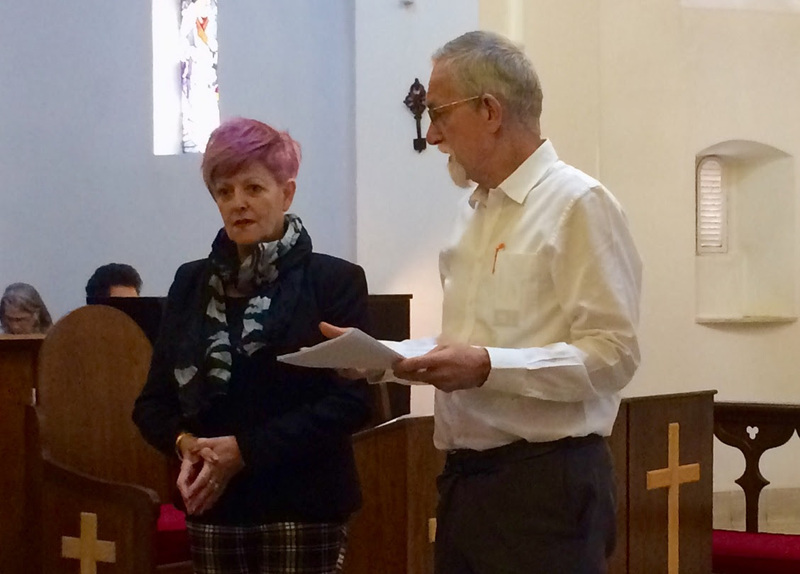 Members in church were able to hand in envelopes with donations which amounted to 2900 EgP and 400 US$. We agreed to form a Leslie Maras fund which can be used for medical help, food and other support needed for Leslie Maras. Today, we presented the CAWU Learning Center during the St. John the Baptist Christmas bazaar. This was our first public fundraiser for the Learning Center. Diana Delamou and Learning Center principal Eileen Werner had prepared special healthy mystery muffin bread, a standard snack at the Learning Center, and some samples of gingerbread cookies that can be ordered in advance for Christmas, Christmas decorations made by Diana, a fun learning experience for her. Eileen brought in a beautiful cross stitched table cloth which had been made by Coptic Ladies back in the 1990’s. Spanish intern Joan Cabrera Robles was a great help at the table. Lori Lawson of PBI (Petrescue Bible Institute), ATTN! (African Teacher Training Network! 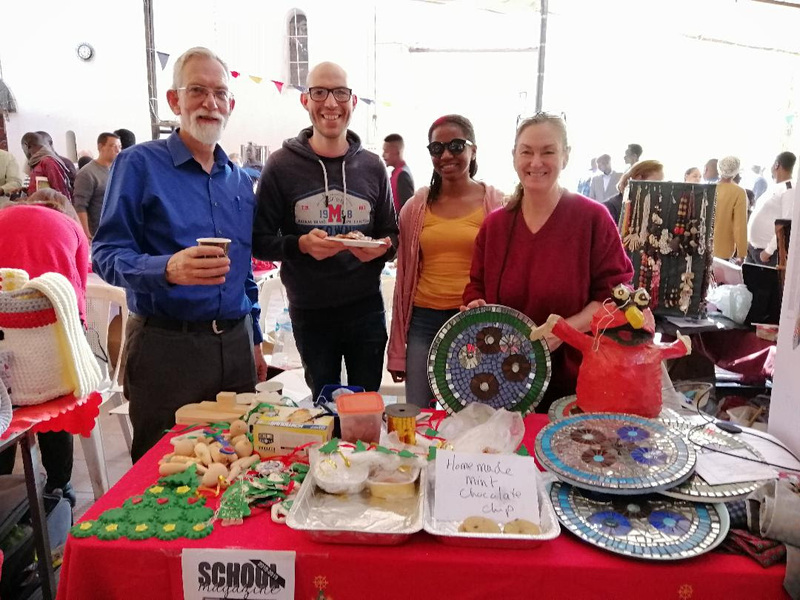 ), and Cairo First Education Center baked wonderful cookies and donated mosaic table tops that had been made by former students of both Eileen and Lori last year. CAWU Learning Center is the result of Eileen’s many years teaching in Cairo; working with children who somehow didn’t fit into the norm at school, both in international schools and refugee schools. This is not a special needs program, but a way of teaching to embrace the differences in learning caused by many reason out of the students’ control. Our learning center’s goal is for all our students to have an internationally recognized high school diploma/certificate to lead to further education so that they can have a better life. ATTN! 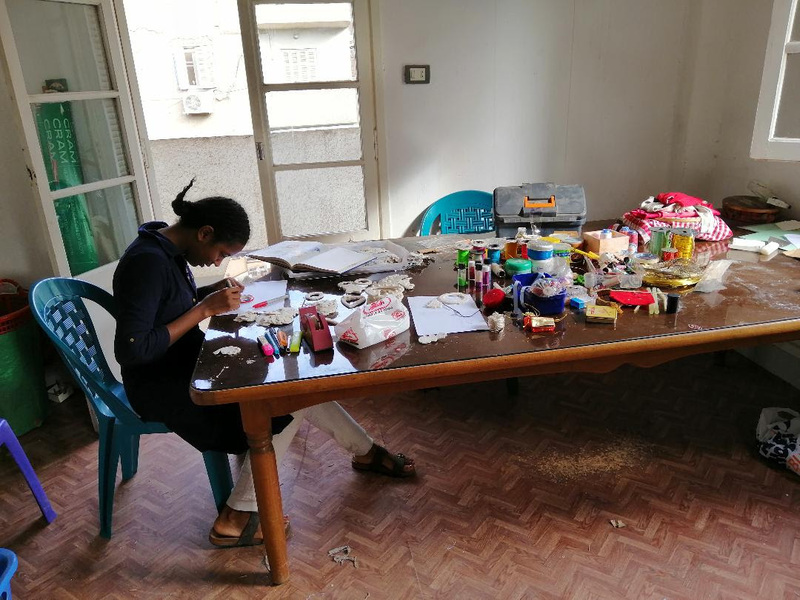 came about during the excavation of numerous resources at Cairo American College (CAC) in 2016/17 (with special thanks to the CAC Alumnae office). 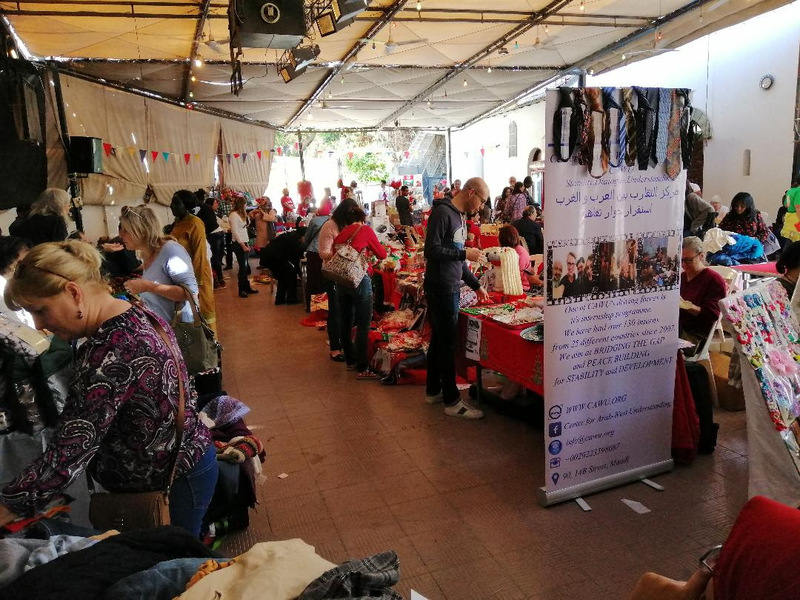 Eileen and Lori coordinated 33 jumbo trucks of books, teaching materials, bookshelves and classroom furniture to needy refugee schools within the Cairo area. Later on, some of those schools, though thankful for the materials, didn’t know what to do with them, and so ATTN! was born to train refugee school teachers and support refugee schools. This program has been running since June 2017 and is a way for refugee teachers to have a certificate of the courses they attended. For more information, please contact Lori Lawson at attncairo@gmail.com or visit the website: attncairo.com. Today, CAWU Learning Center made a grand total of 2440 EgP which was used towards Eileen’s ‘salary’ this month. We spoke with a lot of people who showed an interest in our Learning Center. All flyers that we had prepared including an invitation for an open day of the Learning Center on December 1st were distributed. If you are in Cairo, you are most cordially invited for the Open Day on December 1st, 90 Street 14b, Maadi. Eileen and Diana will explain how the Learning Center functions. There will also be an opportunity to buy more Christmas gifts and make orders for some of the more elaborate items designed and made by both. The learning center is in need of computers – good second hand ones that can be reconfigured to use as teaching aids and reading support would be great. Also audio/visual equipment to support the interactive learning methods used in the center. Make this Christmas an occasion to bless people in need.